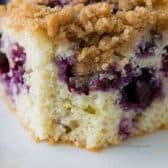 Blueberry Buckle is a deliciously tender lemon kissed cake studded with fresh blueberries and topped with a sweet buttery streusel topping. This old fashioned recipe is a favorite to serve with coffee, tea or for dessert. In a large bowl, cream sugar, butter, egg & lemon zest until fluffy. In a separate bowl combine flour, baking powder, and salt. Add to sugar mixture, alternating with milk mixing just until combined. Toss blueberries with 1 tablespoon flour. Fold into batter and spread in prepared pan. Combine all topping ingredients in a small bowl until crumbly. Sprinkle over batter and bake 40-45 minutes or until a toothpick comes out clean.